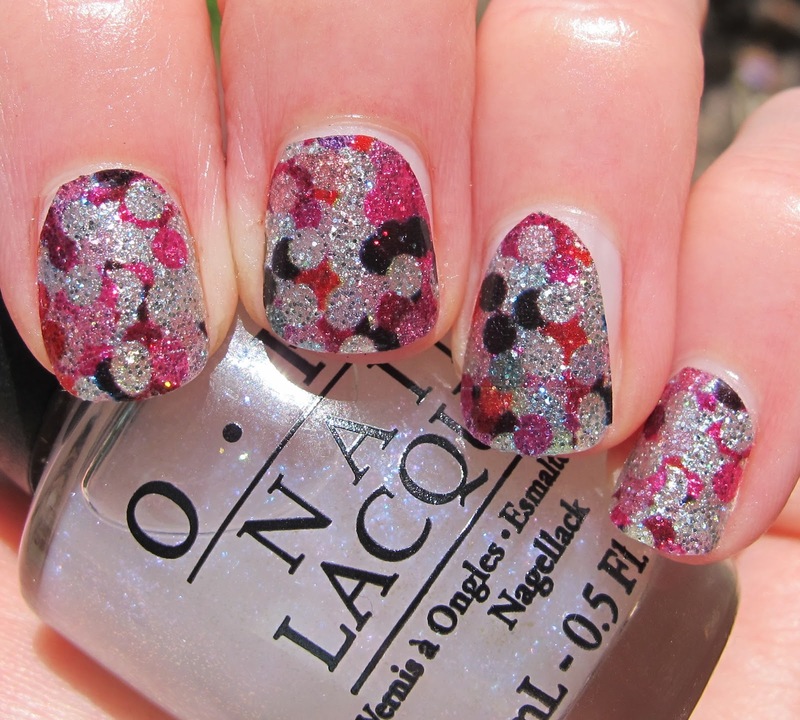 I have one more of OPI's excellent new Nail Apps to show you today. 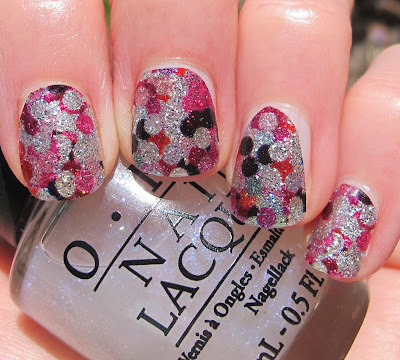 This design is called Girly Glam and it's a glitter-based nail polish sticker. The design is like a swirly almost camouflage-like pattern with silver, pink, bright pink, red, and black. 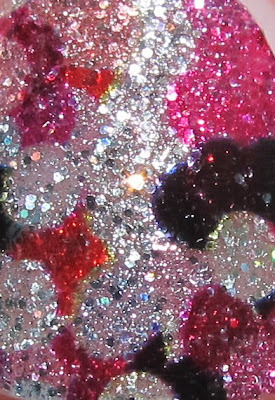 I love this pattern, and the glitter really sparkles. The Girly Glam Nail Apps applied as easily as the other two I reviewed, Reptile and Metallic Waves. The excess was very easy to file off and get the edges smooth. I cut the four largest strips to fit my nails for these swatches, and I obviously didn't really do a great job cutting. But that's my lack of cutting skills, not the fault of the nail apps. When I actually wear these strips for a full mani, I choose the five smallest strips for each hand, and I don't have to cut them at all. The OPI Nail Apps have been lasting for four + days on me, with no chipping or tip wear. By the way, if you are ever rushing out the door without your nails done (unfortunately, I am all the time) to an important event, these are an excellent thing to keep in your purse. I was able to do a set of nail apps in the car on the way to a wedding on Sunday (while my boyfriend was driving, of course). My nails looked awesome and it was way easier than trying to paint my nails in the car and then waiting for them to dry/ruining them upon exiting the vehicle. Pure Lacquer Nail Apps are available now at Professional Salons, including Beauty Brands, Beauty First, Chatters, Dillard’s, JCPenney, Pure Beauty, Regis, Trade Secret, and ULTA, for the suggested retail price of $11.95. I like the design on this one! Me too! Although, I think the Reptile is my favorite of the three!